It’s at about this time of year that my grandfather always used to say ‘Aaah, the nights are drawing in …’. I’ve always loved the darker, colder months, perverse though that may be. And winter just isn’t winter without the additional chill of a genuinely scary ghost story. This year, Lord Halifax’s Ghost Book will be getting a rest whilst I sit by the fire, because I intend to spend my fireside evenings with the audio recording of Michelle Paver‘s new book, Dark Matter, read by none other than Mr Jeremy Northam. Clouds of war are gathering over a fogbound London. Twenty-eight year old Jack is poor, lonely and desperate to change his life. So when he’s offered the chance to be the wireless operator on an Arctic expedition, he jumps at it. Spirits are high as the ship leaves Norway: five men and eight huskies, crossing the Barents Sea by the light of the midnight sun. At last they reach the remote, uninhabited bay where they will camp for the next year. Gruhuken. But the Arctic summer is brief. As night returns to claim the land, Jack feels a creeping unease. One by one, his companions are forced to leave. He faces a stark choice. Stay or go. Soon he will see the last of the sun, as the polar night engulfs the camp in months of darkness. Soon he will reach the point of no return – when the sea will freeze, making escape impossible. And Gruhuken is not uninhabited. Jack is not alone. Something walks there in the dark. A terrifying 1930s ghost story set in the haunting wilderness of the far north. To chill your spine still further, here is the atmospheric trailer for the book (which, sadly, is not voiced by Jeremy). The audiobook and novel are currently available to pre-order at Amazon UK, and the Orion website has details of other outlets and all the formats available. There you are! A long hoped-for sign of life of Mr. Northam and even better than assumed – an audio-work done by the “don” (as Sue Arnold of “The Guardian” called him in her review after listening to “Brideshead Revisited”). Though his fans do concede him a break from certainly hard film business it is such a pleasure that Jeremy has made the most of his time. I also have a special liking for autumn and winter (which sometimes gets me an incredulous glance) – I consider it the best time for listening to a certain melodious, manly and beautiful voice reading a creepy story to me! Thank you very much Gill, for introducing the “Dark Matter” to us! How very exciting!! A new audiobook reading by Jeremy Northam is a cause for celebration! How well Martina phrased it: a “melodious, manly and beautiful voice.” I’d listen to that voice read anything! Thanks so much for the update, Gill! It does sound scary good, Laura! I think I might just listen by flickering candlelight, if I’m brave enough! This sounds great! I love the synopsis and the far north setting. Sounds very intriguing! And, what a terrific choice to pick Jeremy Northam as the reader!! This book seems like a very different genre for him and I’m eagerly looking forward to reading/hearing Jeremy read Dark Matter. Thanks for the update Gill! Looking forward to this one – I’m not a ghost story fan, but with Jeremy Northam reading I reckon I will be converted! I’ve read this book (got sent a proof copy) and it is amazing. Very chilling and scary in places. Such a good book! Can’t wait to hear the audiobook! Hi Ryan, that’s really good to know. I admit, I’m really looking forward to the audiobook (now, more than ever!). I’m looking forward to your review. Please do post a link to it here when you’ve posted it. 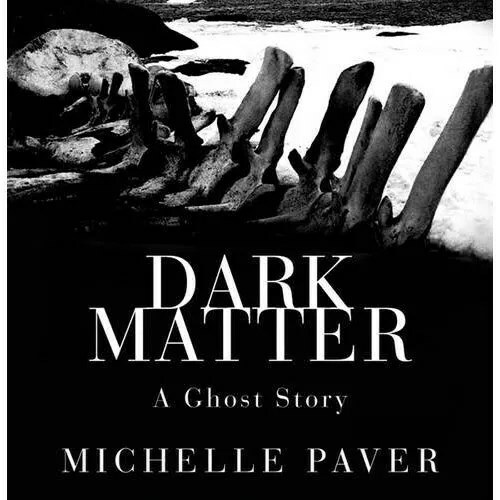 Great news today about Michelle Paver winning the Guardian Children’s Fiction Prize for ‘Ghost Hunter’!